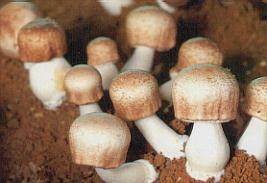 Agaricus blazei. Agaricus blazei is the newest mushroom from the rain forests of Brazil, Agaricus blazei (brasiliensis) contains the highest levels of beta glucan yet found in a mushroom extracts. At 45% beta glucan (non-linear polysaccharide), this extract represents the highest potency available in an Agaricus blazei (brasiliensis) supplement.